No longer just for storing potato chips and soup cans, the traditional kitchen closet is becoming bigger, more luxe and more multifunctional. Architects, contractors and real-estate agents say upscale homeowners are asking for walk-in rooms that serve as workspaces for everything from food prep to gift wrapping to bill-paying. These new “super pantries” are becoming more common as American kitchens have become more open, merging with living rooms and family rooms—with kitchen islands serving as the entertainment hub of the home. Now, some homeowners are moving the clutter and clatter of kitchen activities behind the scenes, where they are less visible to guests. “An open floor plan is great. But not all aspects of the kitchen are great to look at all the time,” says Peter Pfeiffer of Austin-based Barley & Pfeiffer Architects. “It’s my headquarters,” says Kari Oxford, 44 years old, who last spring put a 288-square-foot pantry in the home she shares with her husband, David, in Minneapolis. An amateur photographer, she included a work area with a desk, computer and light box for viewing negatives—alongside cabinets for food storage. The room also has a kitchen sink and a microwave for food prep, a place to put shoes and coats, and a space where she feeds the dog and keeps his food. Because it can be partly seen from her open kitchen, Ms. Oxford’s pantry, which cost about $24,000, is designed to be as attractive as the rest of the house, with the same cabinetry as the kitchen, a high-end sink, windows, and black-and-white tile floors. She has framed photos of her parents and grandparents there, too. Pocket doors allow it to be completely closed off from the rest of the house to hide the occasional clutter. At her Christmas party last year the caterers did all their work in the pantry. “It’s for all the stuff you want handy but can close off,” she says. Cindy Bonds, 52, a self-described retired stay-at-home mom, views the pantry she is building in her new house, by Morgante-Wilson Architects, in Winnetka, Ill., as a “working pantry”—or a second kitchen. It will have a dishwasher, refrigerator, freezer, microwave, sink and a large work surface. It will also help reduce the cabinets they have in the kitchen. The goal is for Ms. Bonds, who likes to cook and entertain, to have a place to prepare food while keeping the ingredients—and the resulting smells—away from guests. “We want the kitchen to be clean and sleek, and have people there without having them be around the mess of cooking,” she says. —Cindy Bonds, of Winnetka, Ill. This latest iteration of the pantry is really just a riff off pantries of yore. In the U.S., a separate room used for storing butter in the 17th and 18th centuries was called a “buttr’y,” says Catherine Seiberling Pond, author of “The Pantry—Its History and Modern Uses.” The mid- to late-1800s saw the arrival of the “butler’s pantry”—a room off the kitchen for storing glassware, dishes and cutlery, where food was plated. In the 1930s, breakfast nooks began to replace separate pantries, and food storage moved to cabinets. Pantries became all but obsolete by the 1950s, says Ms. Pond. It wasn’t until the 1990s, when kitchens became more open, that walk-in pantries returned. 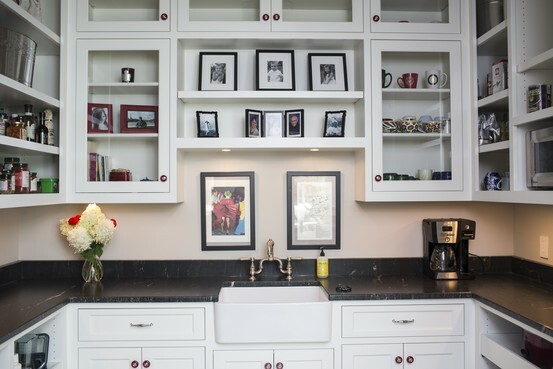 Now, pantries are being done in the same high style as the rest of the home. Food blogger and writer John-Bryan Hopkins, with some 850,000 Twitter followers, was an early influencer, turning what was a library with 12-foot ceilings in his home in Birmingham, Ala., into a pantry. He spent about $2,000 on shelving and lights, and adding a custom wood ladder like the kind found in posh libraries. In his subsequent home, he spent about $5,000 converting a fourth bedroom into a pantry that was almost bigger than the kitchen. Mr. Hopkins’s third creation in a third home, finished in 2008, was a pantry with a commercial refrigerator that had glass doors that could be opened from both the pantry and the kitchen. It had a skylight, a copper roof, custom-made 10-foot doors, wood walls honed on site and a $3,000 farm sink. It cost about $20,000. 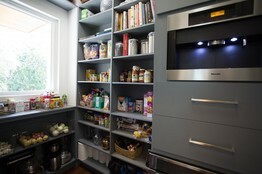 Until recently, that pantry was the background photo for the home page of his website, Foodimentary, which some designers credit for helping fuel the super-pantry trend. A survey by the American Institute of Architects last year found a jump in the number of respondents who said they increased their pantry space: to 42% from 31% a year earlier. When Renee Snyder, 40, a dermatologist, and her husband built a house in Austin, Texas, two years ago, she thought it essential to include a 6-by-9-foot walk-in pantry. The space, valued at about $13,000, is where they keep a mixer, blender, built-in coffee machine and lunch boxes.